You know IVF is all about the shots! And although we aren’t formally trained medical professionals, after going through one round of IVF and now into the second, we know a thing or two about the shots. During our first round (when everything was new) I always said to myself, “It would be so nice if someone would have told me that”. So I’m going to continue to share tips, tricks and all-around helpful information to hopefully make it a little less daunting for someone else. Feel free to comment anytime with any specific questions or concerns you have so I can try to address them! We made this video where we walk you through all of the tips and tricks we’ve learned and what has worked best for us. And further below is a little more detail about each tip, including a link to download an IVF Medication Schedule that I have found really helpful! 1. Enlist your husband to give the injections. If your husband is comfortable (which he should be, hello, he’s only giving the shots not getting them! ), have him do your injections. I liked the idea of Kyle doing my shots for a few reasons. The biggest being, there isn’t much in this process after they give their “sample” that they can do. I feel like this includes them and give them a really important role in the whole process. And for us, it was a bonding experience that is special to us. The nurse will explain everything to both of you during your appointment, so don’t worry. Also, have him practice on some fruit if he is nervous at all. 2. Don’t psych yourself out. When it comes to shots, first of all, don’t look at and analyze the needles and size, especially if you don’t like needles in the first place. This will just psyche you out. Also, don’t think about how many shots, days, etc. you are facing. Just take everything one day at a time, one shot at a time so you don’t overwhelm yourself. Just breathe. You got this. Seriously, I use to cry hysterically when they told me I needed a finger prick at the doctor (where I then told them I’m a grown woman and I don’t want one and they can’t make me anymore, yep, true story) and I was able to do this. So seriously, you can do it! 3. Have all of the injections ready to go. I like Kyle to get all of the injections ready ahead of time and have them lined up and ready to go. It used to make me more nervous to sit there and wait or watch him get the next one ready (until I asked so many questions about whether he was doing it right that he made me go to a different room). So anyway, just have him prep it all and be ready to go so that there isn’t any wait time between each injection. 4. Set a realistic time that will work for both of you. Set a time and stick to that within a two-hour window. We like to aim for 9:30 or 10:00 pm. Brexton is in bed, and even if we went out and went to dinner or something, we are usually home by then. But really, whatever works best for you, just stick to it! During my first round of IVF, I had a lot more medicines to take with the egg retrieval, so to keep myself sane, I made a chart to track all the different medicines and dosages. Life gets so crazy and there’s so much going on, it helps to already have all the thinking done and just follow the chart. 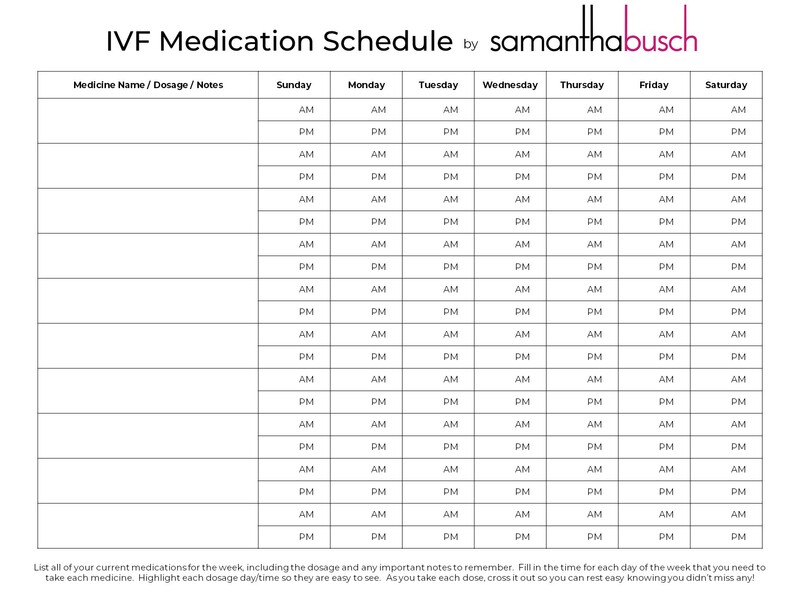 You can download this simple IVF Medication Schedule and keep it with your medicine so you can easily stay on track. 6. Ice the injection site … but not too long! Ice the injection site but not too for long. First, ice vs. no ice, I find to be two totally different experiences, especially when it comes to the bigger needles. In particular, the Gonal F injection pen from our egg retrieval process was a big needle and icing was a must (we aren’t doing egg retrieval this time but you can read out about first experience here). Kyle has found, though, if I ice for more than 5-7 minutes, he thinks it makes it harder for him to get the needle in. Switch sides of your belly every night and try as best you can to not go too close to the other injection sites. Also, I personally found that any injections close to right under my belly button hurt more than on the lower sides. While sitting down, lean over and pinch yourself a roll of skin. Then take a deep breath and, as you are in the middle of your exhale, have him inject you. I also never, ever, ever look at the needle! You will feel it, but being relaxed and exhaling will certainly help. 9. Have a third wheel. If there is a third person in the room, you know like your mom, have her lightly drum her fingers on the opposite side of your stomach from your injection site. A nurse told me that it has something to do with your nerve receptors and brain having to analyze a stimulus on both sides, so it can’t give either the full attention. And, hey, if that’s total BS, well the tapping will at least get your mind off of it! 10. Ask for a smaller needle. When you get to the progesterone in oil, the doctor will give you a huge needle, like a ginormous needle. It’s because the oil is thicker than other liquids (like Lupron for example). But that doesn’t make it feel any better when it pierces your skin! Most people don’t know this, but you can ask your doctor for a smaller needle. It will take longer for the medicine (in the oil) to go through the needle. But I’m OK once the needle is in, having to wait a little longer. It’s the poking through my skin with the ginormous needle that I’m not OK with! I definitely recommend talking to your doctor about this! 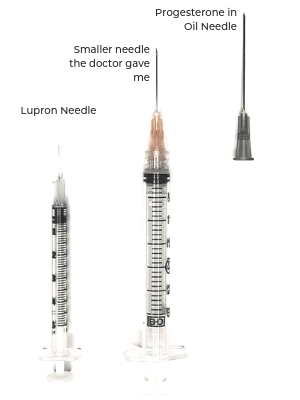 The top needle is the Lupron needle. The bottom needle is what they gave me for the progesterone in oil (what the?!). The middle needle is the smaller needle I asked for! Like I said before, we certainly aren’t professionals, but having gone through the whole process once before, I feel like we learned a lot that is helping us this second time. And my hope is that, by sharing, we can help ease the stress and anxiety for other couples going through this and not knowing what to expect! Please continue to share your stories and your questions. I love hearing them all and am working on a Q&A blog to help answer some of the more popular questions for everyone. Samantha and Kyle, once your eggs were retrieved, were they then fertilized? I only ask because you had stated before, there were 2 little girl embryos and I wasn’t sure. Thank you. I am not going through IVF, but I still enjoy reading your blog about it. I hope and pray you get your healthy baby girl! Praying all goes well with everything. We love and pray for your little family. My husband is a kidney transplant recipient and he uses MedHelper app to remind him when to take his meds and what hes supposed to be taking. Works on android or iPhone. Hi Samantha, I am so happy for you. Best wishes. I really want to send u a gift. Where do I send it? I may not be a Kyle fan on the track, but I am certainly rooting for you both through this journey. It clearly shows your love and commitment to each other and that is a beautiful thing. Wishing you continued blessings and so much good luck in this process. As a mom of 3, I know the joy kids bring. I hope you have as many healthy babies as you desire. Thank you both for sharing something that is so personal. This will help other couples going through the process feel more comfortable. I tried for 10 years to get pregnant and nothing worked, many years ago. God bless you both for your Foundation and the work you are doing. Good luck and hopefully we’ll see a baby bump soon. You’re a very fortunate couple. I have MS (actually we have MS) and my husband has always been helping with injections and anything else the illness entails. Thank you for sharing your journey! After trying for a year to conceive with no luck I found out I have PCOS, so my husband and I started the infertility journey this summer. Everyone around me just looks at their significant other and gets pregnant, so I appreciate hearing the reality of what may lie ahead from someone who’s been there!